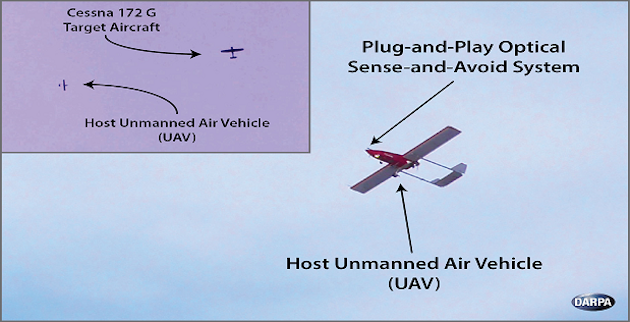 The goal is to have manned and unmanned aircraft steering clear of each other autonomously. Some of the latest consumer drones, such as the DJI Phantom 4, come with an obstacle avoidance system. They're designed for stationary and slow-moving objects, however, like trees and cyclists, rather than aircraft ripping through the sky at 550mph. That poses a problem if we ever want manned and unmanned aircraft playing nicely in the sky. To help, the Defense Advanced Research Projects Agency (DARPA) is working on a new sense-and-avoid (SAA) system. The group recently conducted its first test flight, demonstrating that a shoebox-sized prototype can effectively detect and track a Cessna 172G aircraft approaching from different angles. The system uses an optical camera for detection, as well as "passive ranging features" to predict whether any nearby aircraft will cross its flight path. If there's a potential collision, it'll recommend the best evasive action that complies with air safety regulations. "This SAA system has the potential to enable a wide range of manned and unmanned systems to safely integrate into an increasingly populated and complex airspace," Dan Patt, a Program Manager at DARPA said. "What pilot wouldn't want to set a box on their dashboard that would provide an additional pair of eyes?" DARPA has been working on the project for two years now. Its next step is to shrink the hardware -- a shoebox is still a little large, especially for commercial drones -- continue testing and develop some "mature" features, such as the ability to detect aircraft below the horizon line. If the team is successful, it could result in fewer mid-air collisions, saving lives and improving public confidence in unmanned aerial vehicles.